I don’t know if you got around to reading my post on untitled 163 but I got a great response. I was wondering if I could do a similar thing for this picture. It has the added benefit of being a famous guy. I’d love to get my hands on it for a bit of flash fiction? Plus how did you get the visual, because it’s great. As always, you are welcome to use the drawing. I did read “untitled 163.” I enjoyed it! 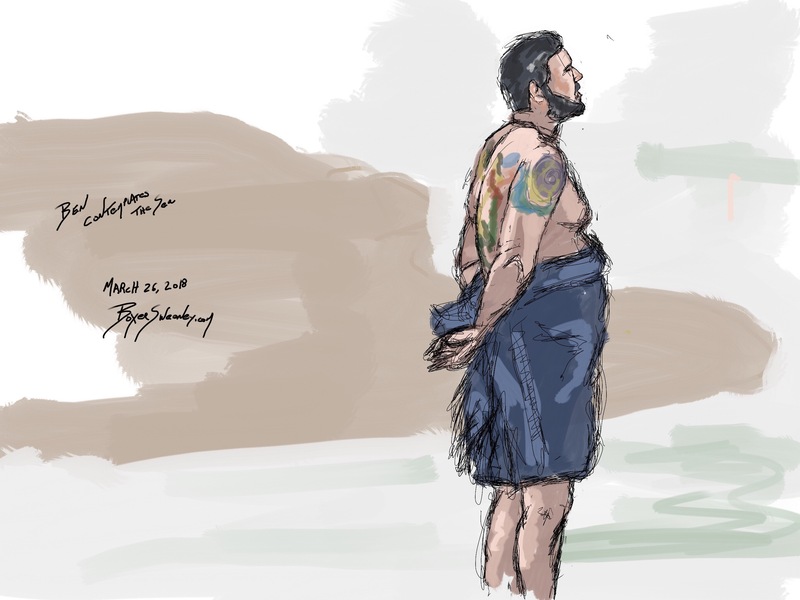 Very distopian 🙂 As for the original image for this drawing, I found it doing an image search for “Ben Afflek back tattoo” I like how he is staring out to sea, sort of holding the towel like an old guy. It has a lost hero kind of vibe. Best of luck in all your efforts!